Microsoft User Community on Facebook is all about connecting technology users to each other, enthusiasts and professionals! The Community Megaphone app amplifies events that are going on in your local community, so that you can connect, network, learn and get involved. 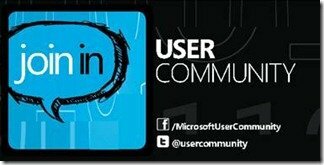 Microsoft User Community is live on Facebook and Twitter. Community Megaphone has been a destination site for US Community Leaders to post their user group events. Community Megaphone application on FB, pulls and updates the entries on the User Community FB page to let an even broader community have visibility into these events. Users can filter by geocode, keyword or even speaker. They can also RSVP to the event, see who else is coming and interact before and after the event. You can access the Megaphone application on the Megaphone tab on the User Community page on FB. Community Megaphone is now on Facebook! Hat tip to Mary Perisic from the US BMO DPE team at Microsoft for the information via email.